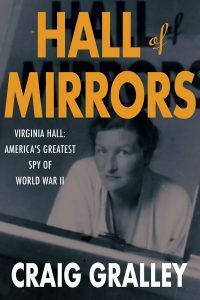 “Hall of Mirrors” is the story of Virginia Hall-a former State Department clerk who, after losing her leg in a hunting accident, suffered discrimination, quit and was recruited to become the Allies’ first spy to live behind the lines in WW II France. She organized resistance groups, conducted sabotage operations, and reported secret intelligence back to the Allies. Eventually betrayed, Hall escaped the Gestapo’s Klaus Barbie (the “Butcher of Lyon”) by crossing the snow-capped Pyrenees, dragging her prosthetic limb behind her. Despite her harrowing escape, Virginia demanded to return to France. Her spymasters refused, telling her it was a suicide mission. But Virginia ignored the dangers-certain capture, horrible torture, a painful death-and returned to France on the eve of the D-Day invasion. Craig Gralley, a freelance writer and author, served previously as a Senior Officer at the Central Intelligence Agency, where he was the chief speechwriter for three CIA directors, including Robert Gates. While at CIA, he heard of Virginia Hall’s heroism and began combing through agency files to learn more about this amazing disabled woman spy. His research took him to the French countryside, where he discovered the trail over the Pyrenees Virginia Hall used to escape Gestapo Chief, Klaus Barbie in the winter of 1942. Craig believes Hall’s incredible and little-known story of courage in the face of intolerance and discrimination has relevance for today and began writing “Hall of Mirrors,” while finishing his graduate degree in Writing at Johns Hopkins. Craig Gralley also holds a graduate degree in Government from Georgetown University. He and his wife Janet enjoy adventure travel and have a son, Will, who is a professional DJ in the Washington, DC area. 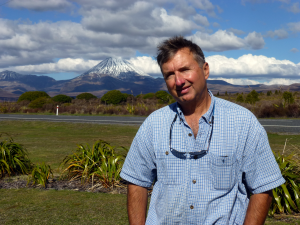 For more information about Craig, visit: www.craiggralley.com. Why did you write a novel about Virginia Hall instead of a biography? Some might consider it an unorthodox choice. After reading hundreds of documents in CIA’s files and at the US and British archives, and after hours of interviews with historians and the last relative who recalls Virginia, I felt I had solid knowledge of this amazing spy—enough to write a good biography. Then I spent time with a psychiatrist who specialized in trauma and he explained Virginia’s likely state of mind after she suffered the amputation of her leg. My knowledge of spy tradecraft and my observation of CIA women agents in the field gave me additional insight into why she acted as she did. After all the reading, interviews, and fieldwork I felt I could go deeper into Virginia’s mind and offer more insight by writing a novel than I could a biography. “Hall of Mirrors” is a more personal story, in Virginia’s words. What was it in Virginia Hall’s personality that drove her greatness? All through my research and fieldwork, I tried to understand the root of Virginia Hall‘s courage; what caused her to persevere in the face of capture, torture, and horrible death. She spied on the enemy and organized sabotage operations while Gestapo wanted posters were circulating, saying: “We must find and destroy her.” Virginia had a strong personality before the hunting accident claimed her leg but the more I read and the more I studied, I thought the key to really understanding Virginia required diving into the event that changed her life. One of my most fascinating interviews was with a psychiatrist who specialized in trauma. He told me something that stuck with me throughout the writing of “Hall of Mirrors.” He said that Virginia might have done heroic things not in spite of her disability but because of it. Virginia Hall, as the author of her own life, had been given a second chance and she wasn’t going to waste it. How did you discover the Freedom Trail Virginia Hall used over the Pyrenees? My wife, Janet, and I arrived at the foot of the Pyrenees armed with only a paragraph from a book written by Vincent Nouzille, an early biographer of Virginia Hall. Nouzille‘s book was written in French, a language my wife speaks, but it offered few clues about the location of the trailhead. After asking a lot of questions and receiving blank stares and shoulder shrugs at France’s Freedom Trail museum, we decided our only option was to go to Villefranche-de-Conflent, where Nouzille said the trail started. After more conversations, more blank stares, and phone calls, we were told by a woman at the tourist information office that she knew nothing of a freedom trail but there was one path, an old one, up the road. “But beware,” she said, “the trail is very steep.” As we followed the unmarked trail past towns identified in Virginia‘s reporting we grew more excited because we knew we’d found the trail Virginia took to escape the Gestapo’s Klaus Barbie.